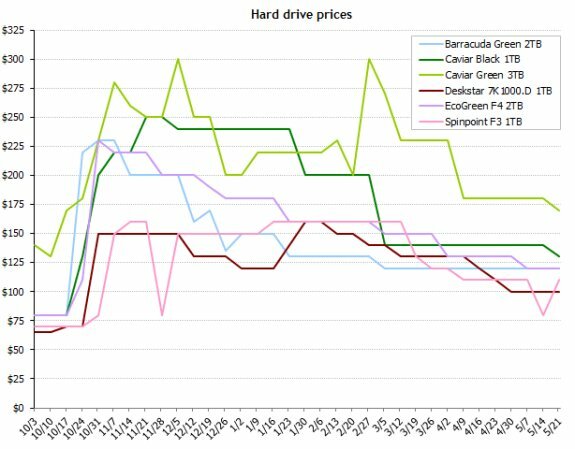 The Tech Report published an updated chart that reflects the evolution of the pricing of hard disk drives since the Thai floods in October. Prices have fallen slightly since the previous chart that was published in early-April, but it appears they're stabilizing at a "new normal". Prices have fallen slightly since our early-April update. The Deskstar 7K1000.D 1TB has enjoyed the most dramatic drop, and it can now be had for an even hundred bucks. Our favorite mechanical drive, Samsung's Spinpoint F3 1TB, was briefly down to $80 before returning to $110. (If you enter the promo code EMCYTZT1637 before tomorrow, you can nab the drive for $80.) Both of those terabyte drives cost less than WD's Caviar Black, which has at least been discounted by $10 over the past month and a half. The other drives we've been following are low-RPM "green" models from Samsung and WD. These higher-capacity drives have dropped in price slightly since the beginning of April, but the cuts only amount to $10 per drive. We're still a long way from pre-flooding levels.